Angela van den Bogerd, Post Office Development Director, spent the entire day under cross-examination on Day 8 of the Bates and others v Post Office group litigation common issues trial. 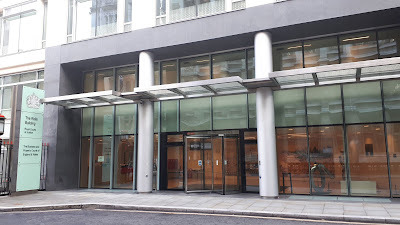 She was answering questions put to her by Patrick Green, QC for the JFSA, who walked Mrs van den Bogerd through a bewildering number of documents, initially painting broad brush strokes and before drilling down into complex issues to make a specific point. 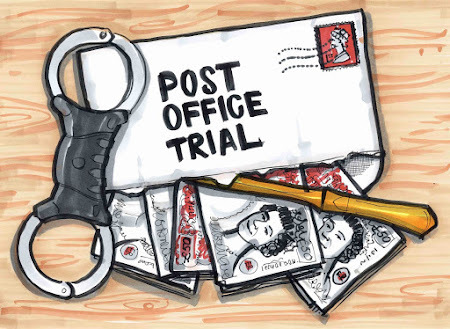 There were a significant number of former Subpostmasters present to hear what Mrs van den Bogerd had to say, though, on occasion, her mumbling, low-volume responses in the witness box made it difficult to pick out exactly what she was saying. Let's deal with the biggest shock. The already infamous September 2010 receipts payments mismatch meeting memo, released via the court and published on this blog last week, had another big secret to reveal. We already knew it concerned a serious Horizon "bug" which had materially changed the accounts of around 40 Post Offices. We already knew that a summary of possible courses of action discussed remote access to Subpostmaster branch accounts. Remote access was presented as as a given, something that until January 2017 the Post Office had denied was possible. What we didn't know is the outcome of the discussion within the memo. SOLUTION ONE- Alter the Horizon Branch figure at the counter to show the discrepancy. Fujitsu would have to manually write an entry value to the local branch account. IMPACT - When the branch comes to complete next Trading Period they would have a discrepancy, which they would have to bring to account. RISK- This has significant data integrity concerns and could lead to questions of "tampering" with the branch system and could generate questions around how the discrepancy was caused.This solution could have moral implications of Post Office changing branch data without informing the branch. SOLUTION TWO - P&BA will journal values from the discrepancy account into the Customer Account and recover/refund via normal processes.This will need to be supported by an approved POL communication. Unlike the branch "POLSAP" remains in balance albeit with an account (discrepancies) that should be cleared. IMPACT - Post Office will be required to explain the reason for a debt recovery/refund even though there is no discrepancy at the branch. RISK - Could potentially highlight to branches that Horizon can lose data. Now because this list of solutions is preceded by the statement: "the groups [sic] recommendation is that solution two should be progressed", it was accepted that this is what did happen. But today Mr Green had something of a revelation. He had been able to discover, through his cross-referencing of responses he had received from the Post Office legal team, that one of the "circa" 40 affected branches had received a balancing transaction via Solution One: Fujitsu manually writing an entry value to the local branch account. When this was presented to Mrs van den Bogerd she was adamant that this would not have been done without the relevant Subpostmaster's knowledge. Mr Green said he had approached the Post Office legal team for the answer to that very question. He wanted to know specifically if they had informed the Subpostmaster. He read the response - a letter saying that as the Subpostmaster in question was not a claimant and as it had very little bearing on the claimants' case, the information would not be released. Mrs van den Bogerd repeated her assertion that the Subpostmaster would have been told. So - asked Mr Green - why not just say yes? Mrs van den Bogerd had no answer. There is an inference that Mr Green was asking the judge to make, and it is a serious one. It is that the Post Office (or Fujitsu at the Post Office's behest) has the capacity to manually enter balancing transactions into individual branch accounts, and has done, without the knowledge of the Subpostmaster. It is important to stress the Post Office has not admitted doing this, but it has also not confirmed it did inform the Subpostmaster that this balancing transaction had taken place, when you would think that if it did happen, it would be very much in their interests to confirm it. The implications of this have been spelled out to me by a senior and experienced figure not connected to either legal team. If the Post Office have the capacity to manually enter balancing transactions into branch accounts without the knowledge of the Subpostmaster, and have done so, the integrity of the Horizon system, particularly, the Subpostmasters' responsibility for their branch accounts is now called into question. Other revelations came thick and fast - internal documents detailing inadequacies in training and support, more Horizon bugs and the need to keep on top of them internally, the near-impossibility of Subpostmasters being able to properly investigate problems being held as debts against them, genuine, provable examples of Subpostmasters being held liable for errors made by Post Office staff or systems and the sheer unpredictability of the Post Office's transaction correction system which is liable to wild swings in value from year to year. I was also somewhat bewildered to hear that it was Post Office policy to require Subpostmasters to put fake transactions through Horizon in order to balance their stock. Mr Green gave the example of stamps. If Horizon said a branch should have 221 stamps, and in fact the branch had 225, the Subpostmaster had to "sell" 4 stamps to a phantom customer to reduce the number to 221. And if there are too few, the Subpostmaster carries out a reverse transaction, again to balance actual stock against Horizon's number. But no money changes hands? asks the judge. Correct, agrees Mrs van den Bogerd. What, said Mr Green, if the Post Office sends out too few stamps and the Postmaster doesn't notice, then carries out a phantom transaction to balance. Does the Subpostmaster then become liable for that discrepancy. "No" said Mrs van den Bogerd. There was a sharp exhalation of breath from at least one of the attendant former Subpostmasters, a bunch of people who have otherwise listened in perfect respectful silence on every day of the proceedings. Mr Green explained the situation again, and on this occasion Mrs van den Bogerd agreed that if the Subpostmaster failed to notice the Post Office's mistake, they take on the liability. I'll be honest I was less surprised by the Post Office shovelling risk onto Subpostmasters (even when it's the Post Office making the initial mistake), than I am by a procedure which requires Subpostmasters to make phantom transactions on Horizon, but there we go. Two moments today really did make me wonder. The first came when Mrs van den Bogerd was presented with a spreadsheet in which she was asked to look at apparent Post Office errors regarding Transaction Corrections on Naushad Abdulla's branch account. After a bit of a grilling on it Mrs van den Bogerd told the court she wasn't really able to comment further on this as she was "coming to it cold". This caused some consternation amongst the claimants' lawyers. After a break, Mr Green pointed out to Mrs van den Bogerd that on Friday 16th November he had received her signed witness statement for the second ("Horizon") trial in this group litigation, which is due to happen in March 2019. He points out that in her Horizon witness statement Mrs van den Bogerd makes specific, quite detailed points about Mr Abdulla's case. She asks to see her witness statement for the Horizon trial. After lunch it is presented to her. Mrs van den Bogerd accepts her phrase "coming to it cold" was a mistake. The second came towards the end of the day when Mr Green read out several paragraphs from Mrs van den Bogerd's witness statement for this trial which had been copied and pasted directly from various Post Office documents including a Post Office rebuttal statement to Second Sight which was written in 2015. I really wish I could have told you what Mrs van den Bogerd said in response to this, and it may well have been perfectly reasonable, but to be honest she was mumbling so much by this stage I could not make out what she was saying. Just as I have asked the NFSP for comment on my recent piece about them, I am hoping the Post Office will see fit to contribute meaningfully to the debate which has been going on outside the courtroom as well as inside it. Whilst I aim to keep my reporting fair and balanced, if the loudest noises are being made by those who are critical of the Post Office, my reporting is almost unavoidably going to reflect that. "The Post Office is robustly defending its position in the court and welcomes the opportunity to do so. We take these cases extremely seriously and we have worked hard over a number of years to address the issues raised. We have conducted thorough investigations and sought to resolve some of the claims through mediation. "It’s important to note that the claimants represent a very small proportion (0.01%) of users of our Horizon computer system users since 2000. "Our employees and postmasters are important to us and we take our relationships with them very seriously. We have confidence in our network of 11,500 Post Office branches and the systems underpinning it. "The Horizon computer system is operated successfully by thousands of employees, postmasters and their staff to process 47 million transactions every week."